Bhimasena said, “Grandsire! I am telling you the truth. The fact is that I am unable to observe even a partial fast by taking only a single meal in a day. Pray how can I observe a complete fast? There is a fire in my stomach called ‘Vrika’, which cannot be pacified unless I eat to my heart’s content. Therefore, O Great among sages! I can observe only one fast in a year. Tell me about one such vrata that will entitle me to heaven and ensure my well-being. I promise to observe that fast meticulously. One who observes the vrata of Ekadashi does not have to face the dark-complexioned, gigantic and fierce messengers of Lord Yama, who hold staffs and nooses. Instead, this devout Vaishanva is finally escorted to the abode of Lord Vishnu by His yellow-clad, Sudarshana chakra-wielding gentle messengers who move with the speed of mind. 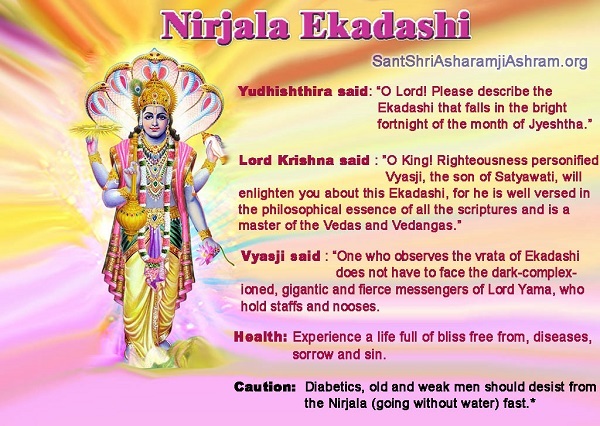 Therefore, by all means, observe a complete fast and worship Lord Vishnu on the day of Nirjala Ekadashi. Men of women, even if they have incurred mountainous sins, are absolved from their evil deeds by observing the vrata of Nirjala Ekadashi. One who observes the vow of not taking water on that day, is entitled to great merits. It is said that such a person attains merits equivalent to donating tens of millions of gold coins for every three-hour period of the day. Whatever virtuous deeds such as holy bath, charity, jap, homa, etc. one performs on this day bestows imperishable merits upon him. This has been declared by Lord Krishna Himself. One who meticulously observes a fast on Nirjala Ekadashi in the prescribed manner attains the position of Lord Vishnu’s devotee. He who takes food on an Ekadashi day, in effect, eats sin. He is like a chandal in this world and is relegated to a lower world after death. Those who observe a fast and engage in charities on the Ekadashi falling in the bright fortnight of Jyeshtha, attain the Supreme state of salvation. Even those sinners, such as the killer of a Brahmin, a drunkard, a thief or one who opposes the Guru, will be delivered from all sins if they observe a fast on this Ekadashi day. After listening to the virtues of Nirjala Ekadashi, Bhimasena also started observing the vrata on this auspicious Ekadashi. Experience a life full of bliss free from, diseases, sorrow and sin.